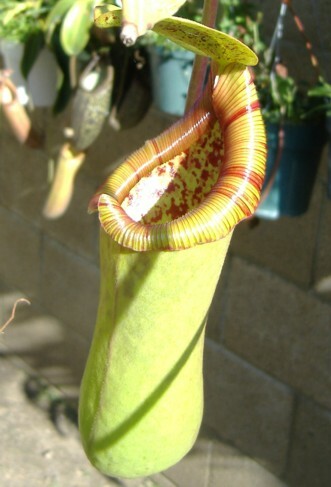 Nepenthes truncata X ventricosa may be an Exotica Plants hybrid between a lowlander and a highlander. I forget where I got this plant from. It may have come from Tristan's Nursery in Hawaii as a rooted cutting but I forget. This hybrid has been finicky for me to grow for some strange reason. Both parent plants are easy growers so I figured this hybrid would be easy as for me outdoors. I finally got a pitcher after having the plant for more than a year. I think my biggest problem was not acclimatizing it properly. It took direct sun first instead of some shade cloth. Then the winter hit and that slowed it down a lot. Now it is doing fine. For optimal growth this hybrid seems to lean to the warmer temperatures but it can tolerate highland conditions. It seems to really prefer more intermediate temperatures than highland. This hybrid might do very well as an indoor plant as long as there's plenty of light for it. It's not a rare hybrid and makes a nice addition to the collection.